Cub Scout Pack 146 serves first through fifth grade boys in the St. Timothy School area in Chantilly, Virginia. We are a member of the National Capital Area Council of the Greater Washington D.C. area and the Sully District. 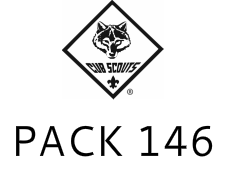 Our mission is to deliver to boys and their families, the Cub Scout Program developed by the Boy Scouts of America. We will always do our best to deliver the highest quality program possible in a safe and fun environment.